Delight in the dapperness of your darling toddlers when they wear this handsome dress shirt and tie set. The long sleeved shirt presents a very standard aesthetic that embraces the minimalism of men's dress fashion for great versatility, which means that this set will look wonderful worn with everything from jeans, to shorts, to fancy dress trousers and jackets. Made from a comfortable and very wearable blend of 65% polyester and 35% cotton, it's also durable and easy to keep looking its best. Both of the included accessories-a pre-tied bow tie and pre-tied neck tie-are crafted from colorful patterned fabrics which coordinate beautifully with the shirts for a complete look that's completely gentlemanly. SUPERB VALUE. Kids' clothes shouldn't be an investment-they should be a promise of durability, affordability, and comfort, which is a principle very well-embraced by this refreshingly priced and high quality toddler's dress shirt, pre-tied bow tie, and pre-tied neck tie set. GREAT FOR ALL-DAY WEAR. Made from a blend of 65% polyester and 35% cotton, the shirt is soft, breathable, and durable enough to wear well even on the most picky or active of children. CREATIVE COLORS. Available in a fantastic range of classic, vivid, and fun colors, this shirt and tie set offers toddlers the opportunity to be self-expressive while still dressing in accordance with the formality and flair required by special occasions. GROWN-UP STYLE. With a laydown collar, a left front pocket, and button cuffs, the shirt emanates an air of maturity and gentlemanliness that will make any toddler look sophisticated. Additionally, both the bow tie and neck tie are crafted from a lively patterned material that contributes just the right amount of youthful exuberance. WEAR IT WITH ANYTHING. 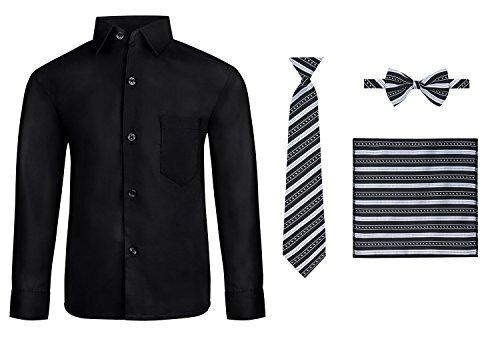 From casual outfits with khakis or jeans to dress trousers, suits, and even tuxedos, this toddler's dress shirt and tie set will look perfectly at place.